Every January hundreds of musicians (vocalist, violinist, drummers) gather at a place for giving performance. Thousands of people visit that place to witness this event. Senior and Junior artists in their respective professions render their skills without getting any monetary renumeration. These programs are televised for people in other places to watch them. There is a massive level of upbeat energy and enthusiasm. This event has been going on since 1940. This is not about a specific music band (or) event organized by music company. There are no entry fees. There are no chairs to sit and you’re required to sit on the floor. This is the event, where current musicians pay their respect to Saint Thyagaraja. Thyagaraja was a great saint as well as great musician. His composition focused on emotional sympathy combined with mystical feelings. His songs on Lord Rama are still popular and the kritis (formats) are performed world over in Carnatic music programs. He is considered one of the three stalwarts of Carnatic Music. Carnatic Music is a system of music commonly associated with southern India. There are thousands of ragas under this system. The five-day event happens on the banks of river Kaveri, at a small town called Thiruvaiyaru in Tamil Nadu State in India. Thiruvaiyaru means there are five rivers around the town. Saint Thyagaraja attained mukti (liberation) in 1847 at this place. An ashram with a temple is constructed at this place. Similar event is also organized in Cleveland, Ohio and San Francisco, California and other major cities across the world. Cleveland aradhana has been conducted for more 30 years without interruptions. 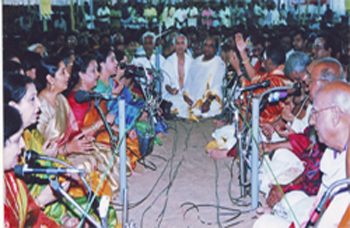 You can visit their website (Thiruvaiyaruthyagarajaaradhana.org) or browse videos in YouTube under ‘Thyagaraja aradhana’.